SRH explains what it is like to be “Broke And Happy”. A few months ago I was looking for new Mike Posner music (if you know me you probably have heard me talk about Mike Posner at least once a day). I decided to take my search to Mike’s twitter page where I saw he had retweeted a post about SRH’s song “Got That”. The song features Mike Ponser on the hook and he also lends his smooth lyrics for a verse. A few seconds into the song SRH jumps into the track with some hard hitting raps. Listening to the track I was stunned thinking “Why have I not heard SRH’s music before?!? !” Once the track ended as fast as I could I downloaded his newest EP “Broke and Happy”. And I was not disappointed; from the first track “Broke and Happy” to the last “SunRoof” he captures you with his story and incredible musical talent. If you are in college / university or remember the good ol days (shouts out to Humber!) then you know exactly what it is like to be broke and happy. 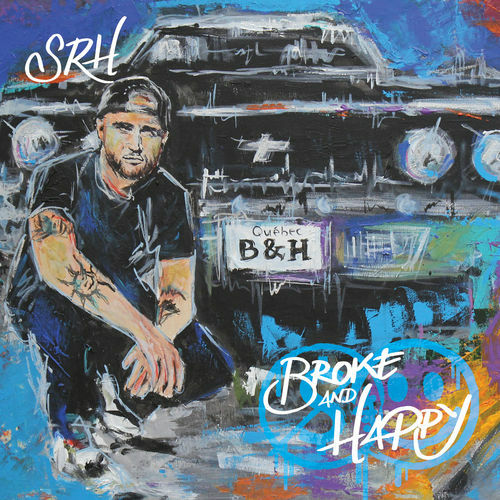 The EP starts out with the title track “Broke and Happy”, an upbeat song about SRH working hard and chasing his dreams. The beat is bouncy and fun, it fits perfectly with SRH’s flow. My second favourite song on “Broke and Happy” is “Got That”. It is a confident boosting song that makes you feel like you could beat Rocky Balboa in an arm wrestling match. (ROCKY I CHALLENGE YOU!) Mike Posner’s beautiful vocals fits well with SRH’s hard hitting rhymes. “Broke and Happy” is not just all up beat, confident boosting songs, you can really hear the deeper message of the tape through the song “Pray”. It talks about trying to chase your goals and make your dreams into reality. On this track you can hear an echo on SRH’s vocals as he raps, which works because it helps to give the song a darker feel. My favourite song from the EP is “Motivated”. The beat is heavy as he talks about how nothing will stop him now. This project really hit me hard because it reflects what a lot of people in their 20’s are going through right now. We are all just working hard till we reach those dreams we think about every day. There is a bright future for the Montreal rapper and I can’t wait to see what he puts out next. Go check out “Broke and Happy” now! Also follow SRH on twitter! I had the chance to interview SRH before the New Year; we talked about everything from “Broke And Happy” to his craziest concert story.